If you're looking for bold, artistic outdoor wall art, our Silver Sun Wall Decor is the perfect answer. This silver circle wall decor features a large sun face and rays, circled by a ring of silver with gold highlights. The elaborate details in the face and rays have a distinctly Haitian look that will appeal to anyone who appreciates folk and tribal art. As with traditional Haitian Metal Art, our Silver Sun is hand painted with great attention to detail, and includes an attached hook for easy wall mounting. It is coated to prevent rusting and UV damage, keeping it beautiful for years to come. 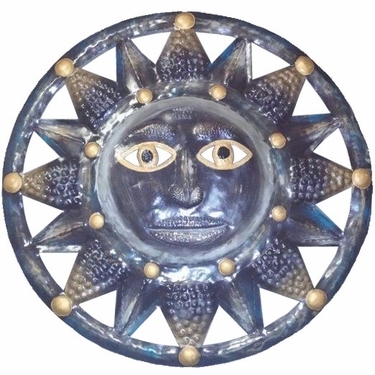 This silver sun art, outdoor or indoor, can be used in a variety of ways. Put it among shrubbery or flowers on a garden wall or by the pool. Hang on your kitchen wall for an elegant morning greeting. Available now in the larger 33 inch size, our small silver sun decor gives the same touch of sophistication in areas where space is limited. These silver sun faces lend a classic look to any setting. Size: Large 33 inch size!